These words were spoken about a woman small of stature but of gigantic proportions in the eyes of humans and God – Mother Theresa of Calcutta. Tomorrow Sunday September 4, Pope Francis will declare her saint, just one day before the anniversary of her death. It is not only the Missionaries of Charity and their friends who will be celebrating the feast day. 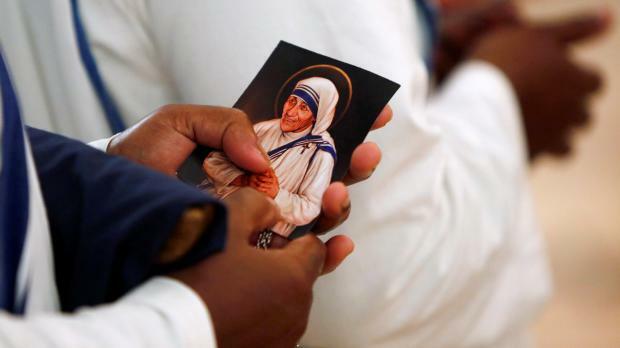 Mother Theresa of Calcutta will be celebrated by the world’s poor. She will be celebrated by all those whose heart she touched and whose actions she helped. She will be celebrated by all those who dream and work for a better world. Her great sainthood lies in a very simple thing. She seriously took the Gospel’s message of love of others. “I was hungry and you gave me food, I was thirsty and you gave me to drink, …” and the rest of the works of corporeal and spiritual mercy. She believed in God’s love for humanity and felt privileged to be its witness. Jesus showed her how much he desired “victims of love” who after recognising their vocation would “radiate His love on souls.” “Come be My light,” He pleaded with her. “I cannot go alone.” Jesus showed her how sad and pained he was when he saw so many poor people neglected and abandoned. He asked Mother Teresa to set up a new religious congregation dedicated to the service of the poorest of the poor. What surprised me a lot is the enormous amount of coverage that the world’s media are giving the canonisation of Mother Theresa. I followed in particular many news features on CNN and BBC. But as those of you who watch Italian and other stations can attest, a similar extensive coverage was also given by these stations. This shows that a world plagued with so many evils and disasters thirst for the witness of love and service that Mother Theresa and so many other give so generously.